Less than five months ago, South Korean president Moon Jae-in gave a speech at the UN General Assembly in which he outlined his dream of welcoming North Korean athletes into the opening stadium at the Pyeongchang Olympics, a joint Korean cheering squad receiving them as part of what he called a “march for peace”. With his speech coming just over two weeks after North Korea’s sixth nuclear test on September 3, it must have seemed that it would remain a pipe dream as international concerns proliferated over the security of the Games, with tensions between the U.S. and North Korea ratcheting up to levels not seen in decades. Five months on, Moon’s wishes have come true, and more. Not only did Korean athletes march under a unified flag in a highly poignant spectacle, but Moon also welcomed a high-level delegation including Kim Yong-nam, North Korea’s nominal head of state, and Kim Jong-un’s sister, Kim Yo-jong – the first member of the Kim family to travel to the South since the Korean War. 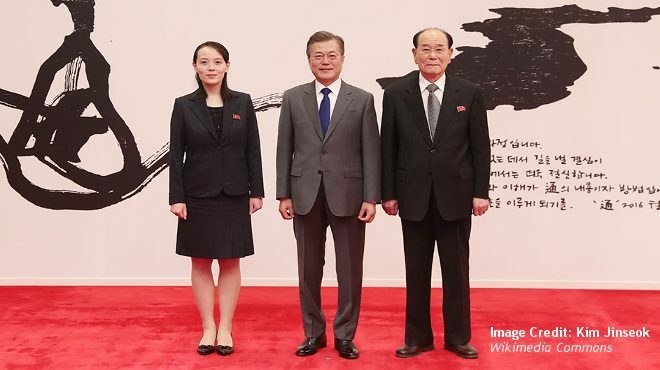 In so doing, she delivered a personal note from her brother inviting Moon to visit Pyongyang for what would be an historic third inter-Korean summit; the last was over a decade ago in 2007 which Moon helped to organize under his then boss, former president Roh Moo-hyun. Given that Pyongyang had rebuffed all of Moon’s overtures for engagement since he became president last May, the recent developments represent a remarkable turnaround. Furthermore, with North Korea so far refraining from further nuclear and missile tests, and joint U.S.-South military exercises postponed, there is hope for renewed diplomatic momentum. Yet Moon is faced with a narrow window of opportunity as he wriggles between a rock and a hard place – the implacable positions of North Korea and the U.S. where the nuclear issue is non-negotiable for both. Moon’s ambiguous response to Kim’s summit invitation in which he reportedly replied, “let’s create the conditions to make that happen,” points to his dilemma. Daylight between Seoul and Washington? Moon knows that he cannot fall too far out of lockstep with Washington which has viewed what it sees as Pyongyang’s charm offensive with grim bemusement. Accordingly, beyond military talks around crisis management and humanitarian measures such as family reunions, any resumption of substantive inter-Korean cooperation, such as reopening the Kaesong Industrial Complex, would fall foul of the sanctions regime and earn sharp rebuke from the Trump administration – that is, unless matched by meaningful yet unlikely measures for denuclearization by Pyongyang. Moon has therefore been careful not to expose too much daylight between himself and Washington. Navigating the architecture of sanctions to enable North Korea’s participation in the Olympics has involved close consultation with both the UN and the U.S. Vice-president Mike Pence also indicated that he had received assurances from Moon that no diplomatic and economic concessions would be proffered to Pyongyang without meaningful steps towards denuclearization. Contrary to Trump’s ill-advised assertion last year, Moon has demonstrated he no naïve appeaser either, as he denounced North Korea’s tests and sought to bolster deterrence measures. But while a wedge might not yet have been driven between the U.S. and South Korea, as some have feared, there is nonetheless a marked difference between the two that Pyongyang clearly hopes to exploit – both to prevent any preemptive strike from the U.S., but also to relieve the significant pressure it is under. For Moon sees the North’s denuclearization as the end goal of a long-term process that, ultimately, can only be achieved through peace and reconciliation. Such an approach recognizes that maximum pressure without engagement will only make it more likely that North Korea will cling to its nukes. For the U.S., on the other hand, there is zero confidence that Pyongyang would voluntarily denuclearize under any other circumstance than exerting unbending diplomatic and economic pressure – in effect to create the conditions by which the regime is faced with a stark choice: to denuclearize or face collapse. And therein lies another difference. While South Korea wants to avoid a war at all costs, the U.S. sees North Korea’s growing nuclear capability as the overriding priority to be countered, including through a military strike if need be. The looming cliff beyond the timeline of the Olympics is the resumption of joint military Key Resolve/Foal Eagle exercises between the U.S. and South Korea. North Korea has already made noises that any such resumption would spell an end to the current thaw, possibly entailing further military and nuclear tests. At the same time, Moon cannot indefinitely postpone them without provoking Washington’s anger and being seen to undermine his country’s defense. The sustainability of Moon’s drive to improve inter-Korean relations thus depends on finding a degree of middle ground between the U.S. and North Korea, even if it is an initial and fragile platform. Arguably the best that could be hoped for is some kind of reduction in scale, relocation, or shorter duration of military exercises – carefully calibrated and communicated as a signal to Pyongyang. In return, North Korea could make a formal announcement of an indefinite freeze to its missile and nuclear tests. If, when, and how we get to such a scenario, it remains to be seen if this could offer a stepping stone for serious negotiations. Washington has already indicated that while it is open to dialogue, it views any freeze as ultimately meaningless unless backed up by what it calls complete, verifiable and irreversible steps towards denuclearization. Pyongyang for its part has branded such demands as nonsensical. Despite the considerable hurdles ahead, Moon’s finely balanced diplomacy between the uncompromising approaches of the U.S. and North Korea deserves a chance. In fact, it might be the only one he gets before the window closes. The alternative is much worse: a seemingly unstoppable collision course between the U.S. and North Korea. Alec Forss is project coordinator and editor with ISDP’s Korea Peninsula Project. The views expressed here are his own alone.